Her rush past me blows some hair into my eyes, blinding me to her getaway on her bicycle. As she pedals away on the dirt road, ignoring my empty threat, my eyes move to the family’s old not-so-white motorbike. The keys are already in the ignition. Then they move to the pile of boxes crowded around the front door, waiting for someone to carry them to the truck. So… maybe I should give her a little bit of a head start? As I straddle the bike to keep it steady, Ma uses the foot pegs to sit sideways, pulling up the bottom of her skirt a little bit so it doesn’t get caught in the wheel. With a little roar, the engine starts immediately, and we’re off down the dirt road. As we pass the houses alternating with the little groves of trees, waves of nostalgia and adrenaline hit me both at once. I urge the bike to go faster, but after hearing Ma clear her throat, I ease off the throttle. Hide and seek is a slightly different game when you’re playing supervised. The green rice paddies and bright blue sky shimmer in the large puddles left by the rain from earlier this morning. The cows seem to be enjoying the cooler weather as well, blocking sections of the road as they move on to another field. It’s a wonderful day for a return to the old ways. Ma leans towards my ear. “Do you remember that you used to say that the world was made of three colors: green, blue, and cows? I think you were right!” Her giggles make me smile. I do not remember ever being that clever, but I’ll take it. I slow us down as we approach the port, easing it to a stop close by the ticket booth. The teenage girl inside issues me three tickets, one each for Ma and me, and one for the bike. The next boat should arrive in a few minutes. Ma gives me a stern look as I give her the ticket. I freeze. And stare at her, my mouth agape. My mind is stuck in a stream of flashbacks of all the instances growing up where I snuck out of the house to meet friends… or – oh no – girlfriends, or just anything that I wasn’t supposed to be doing without their permission. Her warm touch on the back of my neck stops me from completely reliving the full breadth of my adolescent delinquencies. Loud voices and engines suddenly start up. The ferry is here. Thankfully. Ma goes up to the second level of the ferry while I find a spot to park our motorbike. As soon as I get a spot towards the front, more motorbikes come in to fill the area around mine, making it difficult to get to the back of the boat where the stairs are. When I finally reach Ma, she’s staring out over the river, looking thoughtful, a stark contrast to the other passengers attentive to only their phones. Her mouth changes into a small, closed smile. Suddenly a big laugh escapes it. Mission accomplished. She keeps laughing, drawing attention from the other passengers. Now, it’s just mean. I wasn’t THAT stupid. People are starting to get up from their seats; the shoreline is almost in line with the ferry. It’s time to continue the game… after everyone leaves the ferry. Ma needs help getting down the ladder-like stairs so we’re forced to wait for everyone else to leave before we can take our time descending. 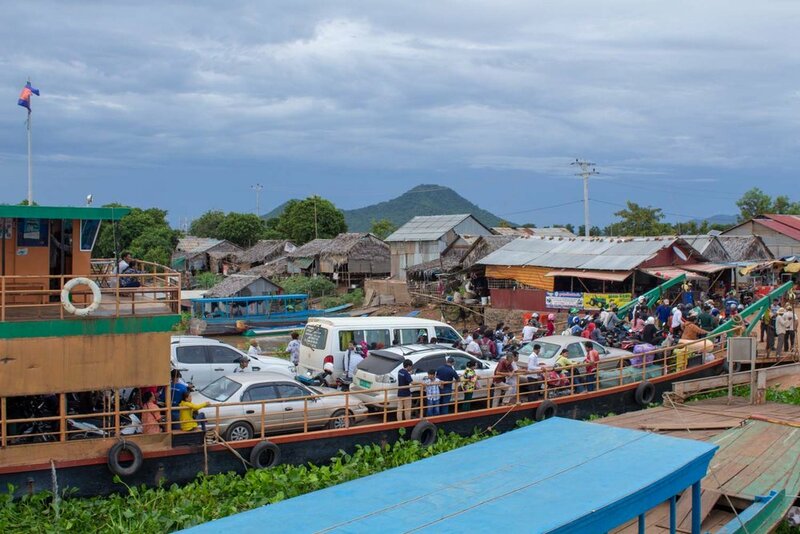 Getting off the ferry is so easy with everyone off the boat and already heading into town. The roads are paved now and there are so many buildings crowding the sides of the road. It’s a sign of what’s to come for our side of the river. Ma is right; change is coming. I drive to the city’s main roundabout, where a smaller replica of Independence Monument was erected. It’s time for a quick drink. The smirk on her face tells me that she knows that my sister would be upset to hear this. We buy another bottle of water from the street vendor and we’re off on a tour of childhood memories. The buildings diminish in frequency as I drive us out of the city center. The road ahead turns to a red dirt road, but I take a right before we get that far. The winding path takes us by more rice fields, less vibrant green than our side of the river, but then a gate appears, with some figures occupying the guard post next to it. I slow down and Ma exhales sharply, gripping the sides of my arms. She doesn’t want to be here. She nods and gets back on the bike, again delicately holding her skirt out of the way of the tires. I take the path from the airport and go straight, ignoring the left turn to go back to the town center. Up ahead is a fork that is surrounded by tall vegetation and trees. I take the left path and we pass by two ruined concrete buildings, another favorite hiding spot. It clicks in my head that these were probably military buildings, probably in connection with the nearby airport. My sister and I were playing in a graveyard without realizing it. The path angles to the right and I find the break in the vegetation on the left. I slow the motorbike down to ease off the pavement onto the rocky grass. I see the little tell-tale stream and we stop. The engine silences and the sounds of the forest envelope us. A few moments later she hears it, a kind of weird soft rumble from off in the trees. The path to the battleground is a little steep in places and not very level in general. I carefully help Ma along the path through the dense vegetation. The rumbles get louder and crazier. Her grip on my arms tells me she’s a little frightened still. My little sister can do that. We arrive at an extremely wide concrete column with a large dark doorway cut into the side of it. Another roar escapes from inside immediately followed by the sound of Peou’s voice, apparently on her phone. I sneak up next to the opening and growl as deep as I can into the water tank. Her reverberating scream overtakes the echoes of my growl. I step into the water tank to see her holding her phone up, the screen in video mode for some messaging app. The light from the hole in the ceiling illuminates her in the surrounding darkness. “Enjoying your last hide and seek game?” I ask, very pleased with myself. I wave in the bright light coming from the phone. “Hello, friends of Peou. This is her brother, Kosal. I am so so sorry that you are friends with her –“ She pulls the phone away from my face. Her angry grunt multiplies into what sounds like a hoard of pigs in the water tank. I grin although she can’t see it. She rushes past me, blowing hair into my eyes again. Her voice snakes into the water tank’s chamber. I hear her asking Ma if she would like to go inside. Ma declines. Her knees have had enough exercise for one day. Peou’s voice is now directed at me. I hear a “What? !” from my sister and then laughter from Ma. After a minute it’s quiet again. I walk to the darkest area of the water tank, away from the door and the ceiling’s opening. The conversations with Ma today are still turning in my head. My childhood was filled with ignorance, but that’s what my parents wanted. They wanted me to see the world as it could be, not as it was. But like the ‘lucky’ ruler, you can’t improve if you don’t understand the consequences of your actions, can you? The light from the ceiling illuminates my hand as I reach forward, cutting it off from the rest of my body still in the darkness. How do you know how beautiful day can be if you’ve never experienced night?